Build strong subject knowledge and skills in A Level History using the in-depth analysis and structured support in this tailor-made series for OCR's British period studies and enquiries. 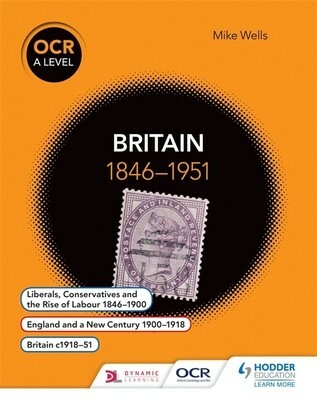 Each title in the OCR A Level History series contains one or two British period studies and its associated enquiry, providing complete support for every option in Unit Group 1. This title explores the period from dominance of the Liberals and Conservatives in the nineteenth century to the rise of Labour and their governments of 1945-51 through two British period studies and one enquiry. It allows an in-depth understanding of the key historical knowledge, terms and concepts relevant to the period studied and encourages the critical use of evidence in investigating and assessing historical questions in the associated enquiry: 'England and a New Century c1900-1918'.